Fixed cams may be specified for applications requiring more than one actuation per 360 degrees of cam rotation. 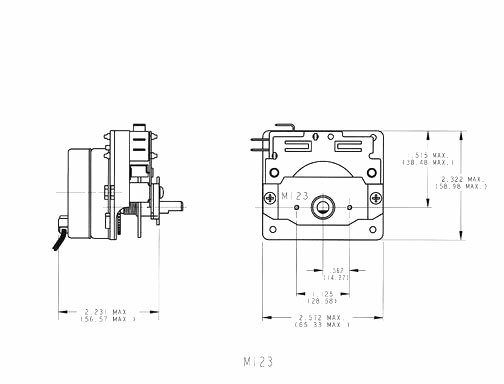 Our M123 electromechanical timers have an open frame design that uses micro snap switches that operate on the cam. From one to three single-pole single-throw (SPST) or single-pole double-throw (SPDT) 15 amperes "snap action" switches may be specified. Contact Midwest Timer Service today for more information. 15 amp, 1/2 HP, 125/250 VAC. .187" (4.75) male spade with .250" (6.35) terminals optional. Cycle times ranging from 10 seconds to 36 hours available. Permanent magnet, 24 VAC, 115 VAC or 230 VAC nominal voltage inputs at 50 Hz, 60 Hz or 50/60 Hz. Motor leads 7" (177.8) long with .187 (4.75) strip standard. Quick connect terminals optional. Clockwise standard. Counterclockwise available with fixed cams. Low torque one-way clutch for manual setting. .248" (6.3) diameter steel shaft. 500" (12.7) long with .375" (9.35) flat. Other configurations available. Two #6-32 tapped holes adjacent to the shaft. Commercial air conditioning, heat pumps.